I think quite a bit when I’m out for a run in fact some of my best ideas come tome when I run. I don’t recall many of them by the time I return home, but they were there once. 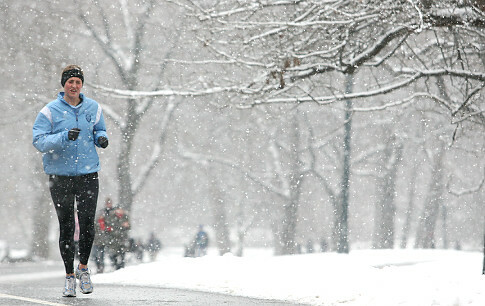 I have always had a love/hate relationship with running during the winter. Growing up in the northeast you don’t have many choices. You hate it but run anyway. You learn to love the weather and enjoy the run, you don’t run or you navigate toward the gym and either the dreadmill or the elliptical. I dislike the dreadmill. I cannot even begin to think what it would take me to retreat to the gym and run on this God forsaken device. I’ll use the elliptical when I’m injured or simply feeling burned out from forcing a run on the same old road course. The elliptical for me is less torturous than the dreadmill and a device I can learn to respect if not enjoy. Running and not enjoying the run is simply not an option for me. I love the outdoors and plain and simple, it’s a place I need to be. It’s a place which rejuvenates my spirit; either on the trails or off. I’ll time my run to make sure I arrive at one of the best spots to view a sunrise. That view and the memory created is enough to set a foundation for the remainder of my day. I completed a run the other day which in some rather sloppy conditions. I chose a pair of trail shoes with a deep lug pattern, pulled on the balaclava, hat, tights and fleece. I switched on the headlamp and off I went. As I ran, my feet slipping on loosely packed snow, I thought about what I like and what I don’t about running in the winter. I love running on packed snow in freezing temperatures. The sound of crunching snow, to me anyway is an amazing sound. I love running at 4 AM after a new snow with nothing but the light from my headlamp and the crunching of snow beneath my feet to accompany me. Solitude! Timing my run just right to catch the sunrise as it glistens like diamonds across the snow, especially a new snowfall. I love running when the snow is falling, blowing not so much, but lightly falling. I like being the first person to put footprints on the new snow. My headlamp is brighter when it reflects off the snow. Cars who cross the double yellow to pass a car turning right but won’t budge an inch for a runner or cyclist. Snow pack along the side of the road which offers no escape route. Getting splashed by slush when it’s 5-degrees outside. I don’t like wearing tights. I don’t like the cold…sometimes. Email me and let me know if you enjoy running outside during the winter or if you’re a runner who retreats to the warmth of the indoors. Either way, get up off that couch and run! I love cold, crisp sunny days. It means you can run routes that are usually too muddy in the winter and get some variation. 4am is far too early for me!